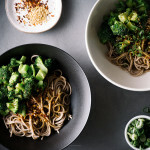 This is the kind of super simple meal I throw together when I don’t have much in the fridge – maybe just a couple of languishing stalks of broccoli. This happens more often than I’d like because I’m really bad at making grocery lists. You know how they tell you to not go to the grocery store and shop when you’re hungry? Well, if I go to the grocery store when I’m not hungry I end up buying next to nothing. If I don’t have list, it’s even worse. Thankfully I always have a bunch of pantry staples (my pantry staples consist of carbs, always carbs) that I can fall back on. 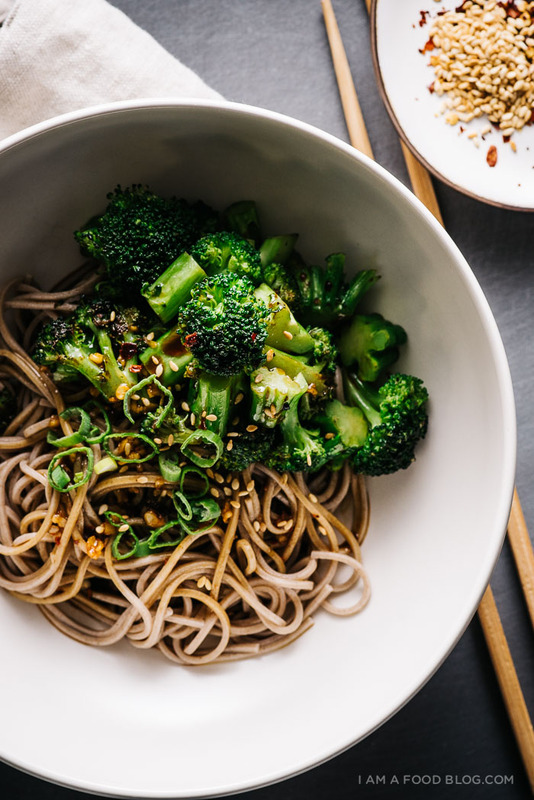 Soba is always a good bet. I love their texture and buckwheat-y flavour. Even better when they’re tossed in a soy-vinegar dressing! By the way, how awesome is the pot that I cooked the soba in?! I spied a bigger version at my mom’s house and she was so, so nice to give me its little brother! I made a comment on the big version she was using and I guess I sounded a little too enthusiastic because all of a sudden she pulled out a mini version and insisted that I take it home because she wasn’t using it. I think it’s absolutely perfect. Mike called me a brat for taking it because now that I’m grown up, I shouldn’t be taking things from my mom. But I’m sure I made her happy by taking her pot?! Okay, maybe it was a little bratty of me to take the pot. To make it up to her I took her out for lunch the other day. But then, when I tried to pay, she pushed my hand aside and told the waitress “she doesn’t work, don’t take her money!” I retorted back, “Don’t listen to her, she’s lying – she thinks what I do isn’t work! And she’s retired!” The waitress took my money. Win! Heat up a heavy cast iron skillet over medium-high to high heat, add a touch of oil and swirl to coat. Add the broccoli in and let cook, stirring occasionally for 2-3 minutes. The broccoli should be bright green and deeply charred. Season with salt and pepper to taste. Remove from the pan and set aside. Bring a pot of water to boil and cook the soba according to the package. While the soba is cooking, make the dressing. 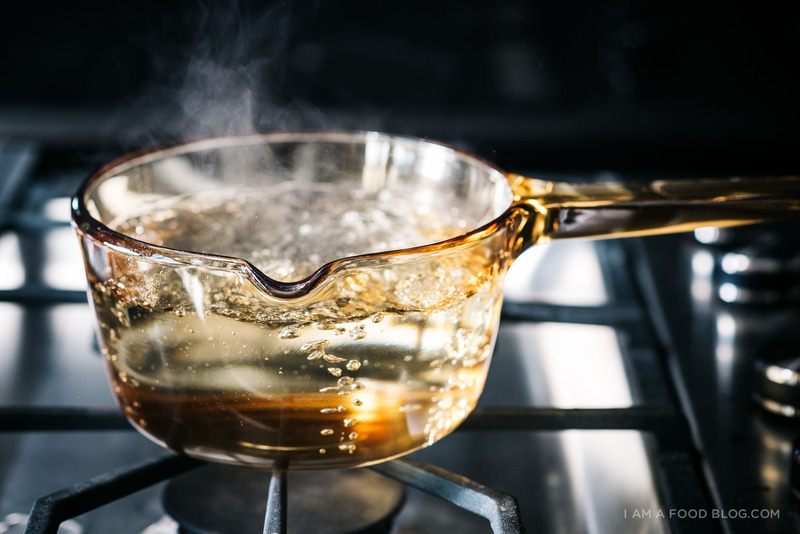 Whisk together the rice vinegar, toasted sesame oil, soy sauce, and garlic in a small bowl. Taste and adjust if needed. 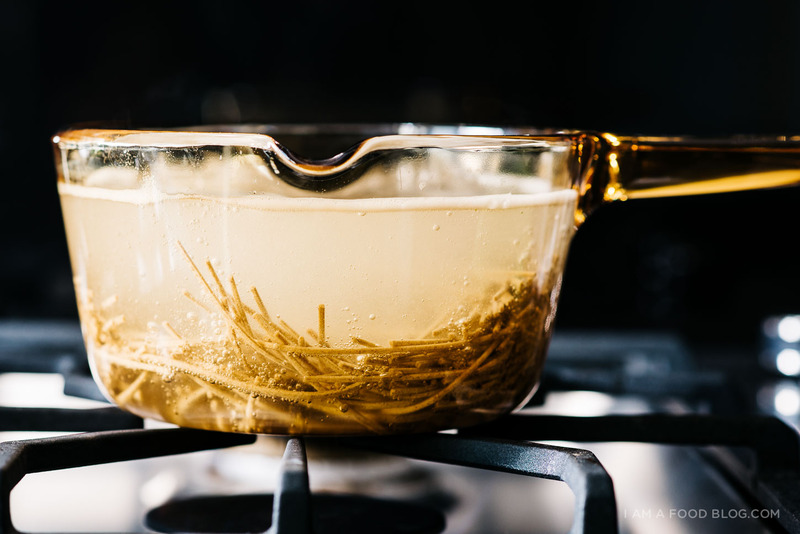 When the soba is cooked, rinse in cold water and drain well. Toss the noodles with the dressing and top with the broccoli. Enjoy with red pepper flakes and toasted sesame seeds, if desired. lol. you and your mom are so cute. ps, i take plates and kitchenware from my mom all the time. oops. Amazing photos! Those first two are incredible! Oh wow, I never have thar kind of a grocery store problem. Even when I’m not hungry at all I end up buying 14 zillion items. 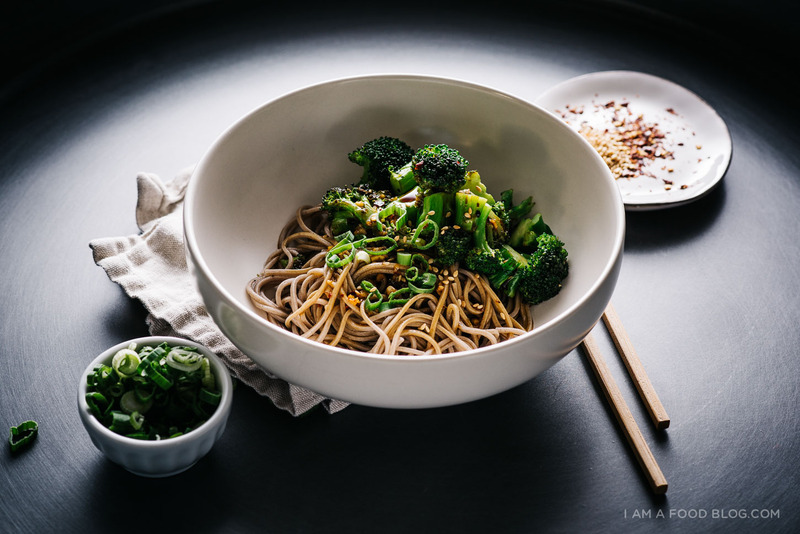 But I’m all for using those languishing broccoli bunches with this bowl :) yum. Classic mom. :) I’m sure she loved giving you that pot. Whenever I fly home to Cali, my mom sends me back with fresh lime leaves, kumquats, and baggies of MSG, even though I can buy all of those things in Chicago (and I don’t even cook with MSG). That is a gorgeous cooking vessel! Can you tell us the name of the maker? Hahaha you crack me up! I think my grandma had a bunch of pots like that one. I’m sure you made your mother very happy by taking it. I love this kind of simple meal for weeknights and happen to have every ingredient for it in my fridge right now – whee! What a glorious pot!! Any idea where I could find one of those?? Yummy, I need to try this! I think we are never too old to take stuff from our moms. :) All pictures look amazing. Specially the one with boiling pasta. delighted to see you used the broccoli stems. Why does everybody always throw those out? This looks delicious! Your pictures are gorgeous! Aww, I love that story about you and your mom. And that pot is totally adorable… how could anyone resist it?! This recipe looks delicious. 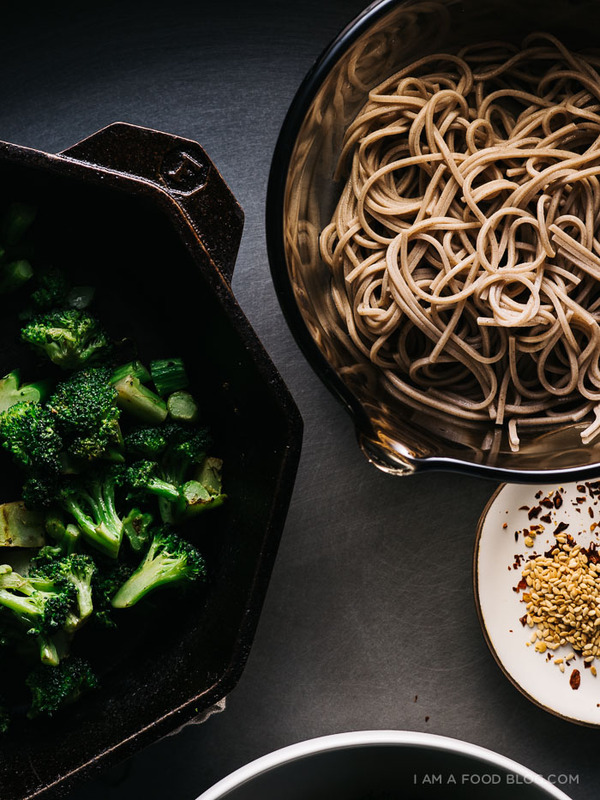 Carbs + Broccoli = Amazingness. I love those pots! I just scored three of them in various sizes from the gig moving out of my new apartment. Amazing! 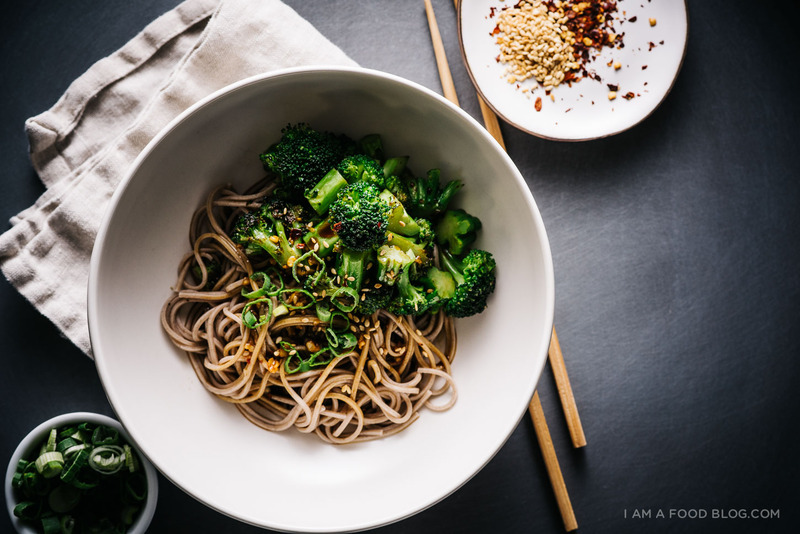 I don’t care if this is a ‘last resort’ meal- I love soba and I love broccoli- so yum! Love this! 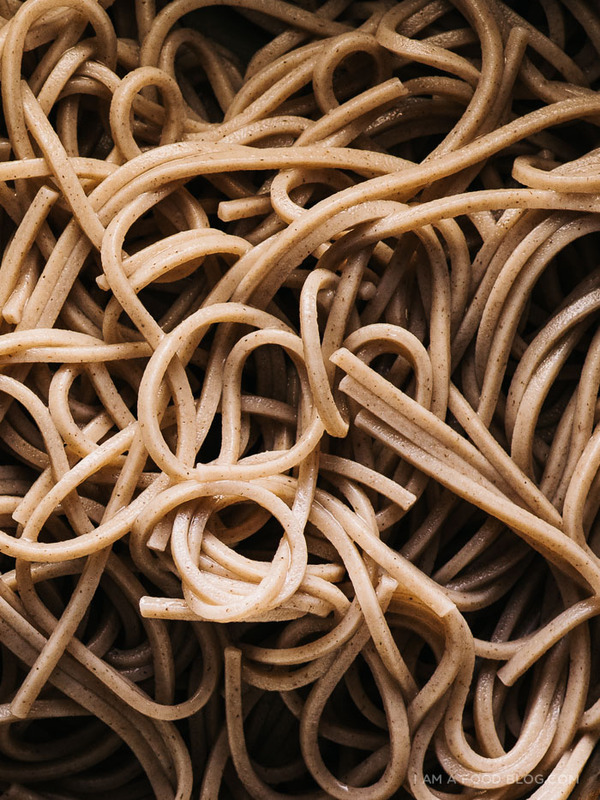 Question: Which brand of soba noodles do you enjoy? I’m having a hard time finding a brand that I like. Such a beautiful bowl of soba. I made this last night for dinner and loved it! My boyfriend also gobbled it up. I absolutely loved the dressing, and the whole thing comes together so quickly! Major weeknight win! 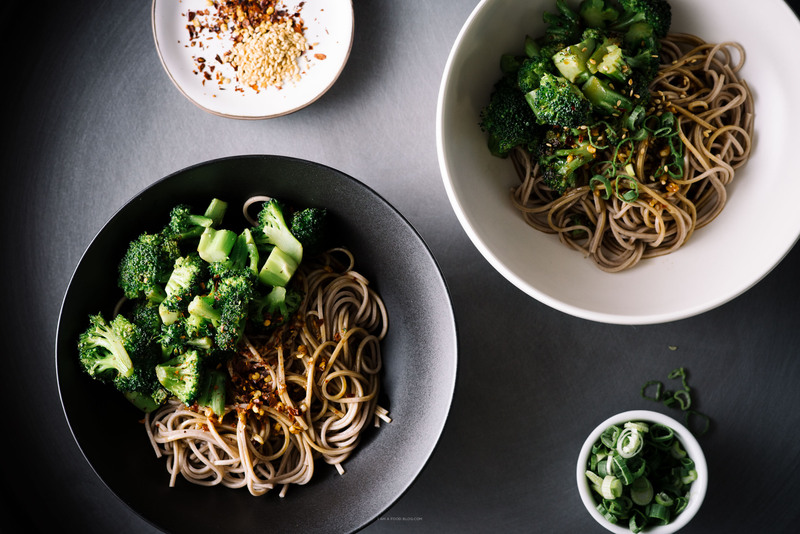 I could see serving soba + this dressing + any delicious veggies I have on hand. The only modification I made was to steam the broccoli a bit because we don’t like it too crunchy, and I loved the charred outside with the tender inside. I didn’t add sesame seeds because I didn’t have any but I think they’d make a lovely addition and plan to buy some. Thanks for this!! I love adding Shiitakes to this recipe. Yum. Thank you! Just made this, super easy and delicious. Tried this last night at home. My cooking was out of perfection but yet was delicious. Thank you for that recipe. This is going on my “Got to Try ASAP” List! Looks delcious! Amazing recipe! I just ate this for dinner. A real winner!